Wikipedia describes automation as “the technology by which a process or procedure is performed without human assistance” and later describes the word’s popularity coming from the Ford motor company establishing an automation department back in 1947. Today technology automation is generally regarded as a significant enabler of improvement in levels of solution implementation quality, efficiency, accountability and predictability whilst at the same time reducing implementation timescales, costs, solution inconsistencies and associated levels of business risk. Whilst the benefits are clear, large scale automation has still been a challenge for many companies to successfully implement in today’s modern world. The successful transition through large scale modernisation is nothing new, along with Ford, the Industrial Revolution which started around the 1780s brought with it new manufacturing processes and a transition from hand production methods to machines. The key to both was not just the introduction of new machines and processes but a fundamental change to their environments. In terms of the industrial revolution this environment change was the introduction of factories. With the previous domestic system, people worked in their own homes, whereas with the advent new manufacturing processes, people had to locate where the new steam powered machines were. So the core environment was changed as factories were created to combine the people with the machines. Again, with Ford, not only did they introduce machines that could stamp out parts automatically, they changed the factory landscape by inventing the assembly line. This integrated humans and the machines working together side by side, creating a blue print still in use today. In today’s modern world this lesson has not been learned by all. Many organisation’s efforts in automation involving attempts to layer processes, scripts and tooling on top of the unchanged existing landscape. With some of the infrastructure in many organisations dating back at least one decade and wide differences in hardware operating systems, storage, databases, versions and build standards, the variations any automation needs to be programmed for typically makes it prohibitively expensive and unreliable. Cloud offers a unified standardised programmable platform enabling high levels of automation. Unlike many on-premise environments Cloud offers a unified standardised programmable platform, enabling high levels of automation. It is a scalable landscape that has been built with automation in mind, enabling various API calls which not only benefit the provision, but also the continuous management of systems on this platform. This in turn helps to realise all the automation benefits originally discussed (quality, accountability, predictability) whilst reducing time, cost, risk, inconsistency and materials. In this respect the Public Cloud is very similar to Ford’s production lines and the industrial factories before them. It successfully integrates key elements that its predecessor (on-premise) typically fails to match; in this case infrastructure facilities and services with automation code. Being able to call on these key integrations not only puts an organisation years ahead of attempting its own on-premise automation program, but for many, moving to Public Cloud is likely to make high levels of automation substantially less expensive to implement. 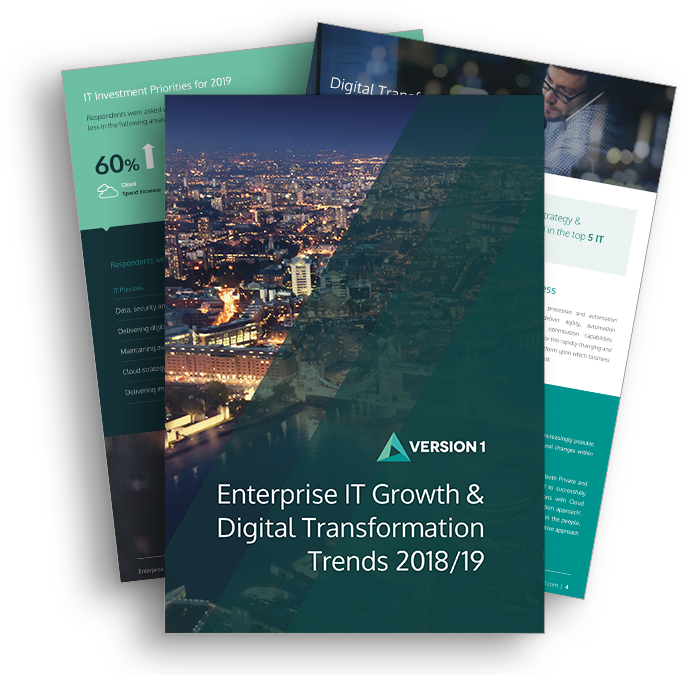 To learn more about how your organisation can realise the benefits of Cloud and Automation contact the Enterprise Cloud experts at Version 1. Experts at developing Cloud strategies that deliver real business beneﬁts, regardless of the complexity of your enterprise application estate. Version 1 provides the full range of services for enterprise applications in the Cloud. Version 1 proves that IT can make a real difference to our customers’ businesses. We are trusted by global brands to deliver IT services and solutions that drive customer success.